K. Vikram Rastogi, a post graduage engineer, is a multifarious personality with achievements in the fields of teaching stone & architecture, educationist, consultant, trainer and book writer. He is presently the president of Stone Technology Centre Group (widely known as STC Group), Jaipur and has worked as Training Service Provider at Stone Artisan Park Training Institute (SAPTI) at Ambaji and Dhrangadhra in Gujarat for more than five years. This was a skill development training programme in stone sector sponsored by Government of Gujarat. He has rendered a dedicated service of more than four and a half decades in different fields with three and a half decades in stone industry alone. He started his career as an Associate Lecturer in the erstwhile Malviya Regional Engineering College, Jaipur (now MNIT) in 1967 and taught graduate and post-graduate students in Mechanical Engineering for 11 years. He then took up job with Government Corporation involved in stone mining and processing and later, started working independently by setting up his own concern catering to the requirements of all facets of the stone industry-publication, consultancy, conducting pre-feasibility and feasibility studies for setting up of stone mining and processing industries, setting up of institutions, conducting training courses, organizing workshops and seminars. Rastogi worked as a consultant with Commonwealth Secretariat, London for implementation of their marble and granite projects in the countries of Africa, Asia, Pacific, Caribbean and Far-East regions. A feasibility study was prepared for implementation of a state project in Bhutan for UNIDO. K. Vikram Rastogi has been associated with the development of "Shaktisthla" (an open geological garden) in New Delhi, at the Samadhi of the former Prime Minister of India, Mrs. Indira Gandhi. He prepared the Project Report for Setting up the Centre for Development of Stones in Jaipur and another Marble Technical Institute in a South Asian country. He contributed significantly in drafting of project report for setting up of International Stone Research Centre (ISRC) in Gujarat. He successfully conducted various vocational skill development training programmes of one week, 3-4 moths and one year in stone sector for school pass outs/ drop outs in two state of the art institutes - Stone Artisan Park Training Institutes (SAPTIs), set up by the Government of Gujarat at Ambaji and Dhrangadhra for almost five years and secured jobs for pass out trainee students in Gujarat and other states of the country. Recently, a project for Study and Development of Improved Took Kits for Stone Craft Artisans of Varanasi, Uttar Pradesh, was completed for National Centre for Design and Product Development, New Delhi, an enterprise of Government of India (Ministry of Textiles). Rastogi has visited more than 43 countries of the world during his over 100 visits abroad. He has attended almost all the important natural stone fairs held all over the world. They include Marmomacc Verona and Carrara in Italy; MARBLE, Izmir, Turkey; Stone+tec Nurenberg, Germany; Stonetech, Beijing / Shanghai and Ziamen Stone fair, Xiamen, China. K. Vikram Rastogi has authored seven books on Dimension Stone and also papers in National and International journals and conferences. He is internationally recognized as an expert in stone, architecture and training and was invited to present technical papers as keynote speaker / speaker at seven global forums like Global Stone Technology Forum at Jaipur; V. Global Stone Congress at Antalya, Turkey; Congress for Stone Design and Building Technology held during MS Africa in Cairo, Egypt; World Stone Congress at Xiamen Stone Fair, 2015 at Xiamen, China; two technical papers in Middel East Stone Show Educational Programme at Dubai, UAE; First Annual Construction Research Conference and Exhibition in Nairobi, Kenya; and again at Global Stone Technology Forum held recently at Udaipur, India. Earlier, he chaired a technical session and was Keynote speaker in another technical session in India Stone Mart, 2003 in Jaipur. He also contributed as co-chairman of a technical session in Sandstone Spectrum 2003, at Jodhpur. Rastogi works as editor of Stone Panorama, the largest stone magazine in Asia and the third largest in the world. He also edits Architecture and Interiors International Panorama, a leading quarterly magazine on architecture. K. Vikram Rastogi has won laurels at National and International levels in his field. He was conferred the title of "di Cavaliere" by the administration of St. Ambrogio, Italy in 1983 and "Certificate of Merit" by the Government of Rajasthan on 26th January, 1988. As a training service provider, SAPTI received the first National Education Excellence Award, 2013 from the Government of India in association with ASSOCHAM for Best Government Initiative under Vocational and Skill Development Training. On 25th December, 2016, he was awarded "Certificate of Honour" by Mahamana Malviya Mission, New Delhi, on the occasion of the centenary celebration of BHU. 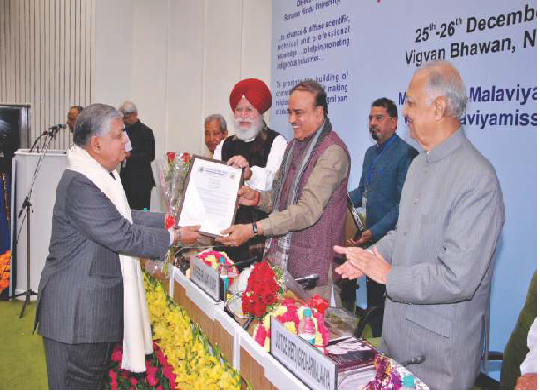 The certificate was awarded Jointly by Shri H.N. Ananth Kumar, Hon'ble Minister of Parliamentary Affairs & Chemicals and Fertilizers and Shri S.S. Ahluwalia, Minister of State for Agriculture and Farmers Welfare, Govt. of India. Rastogi is recognized today as an authority on stone sector, within the country as well as internationally.